Lately, time has been running away with me, with the result that I’ve done few blog entries. I was determined to make up for that tonight, despite the fact that I had only a few minutes to spare. Quick photos done under strip light don’t give the best results. I know that, and yet I still continue to do it. These photos don’t do justice to a rare and beautiful pen. It’s a Blackbird of the BB2 range and I believe that this grey, red, bronze and black marbled pattern is the one that is coded 39. I’ve seen one occasionally but I’ve never had one in my hands before. It was issued without a clip and an accommodation clip has been fitted later. It’s quite unlike any of the other Swan patterns that I have seen. The individual patches of colour are small and the effect is like the fragmented colouring that you see in some geological samples. It may be that this is one of the patterns that also appears in Visofils. As if that wasn’t enough, the small nib is a flexible stub! 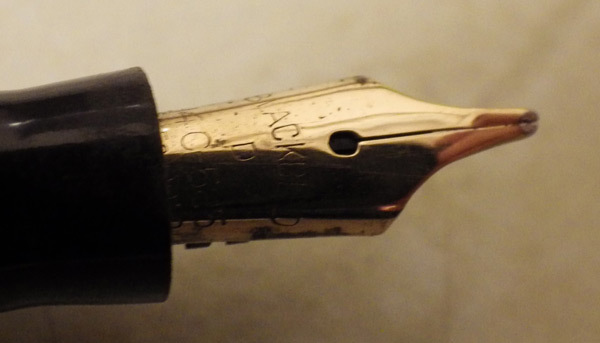 What a gorgeous pen and I’ll bet that the nib as you describe it is a joy to use. Mabie Todd produced so many lovely pens. One point: the section appears to be an unusual shape; all the Blackbirds I have had have sections shaped like Swan ones with one exception: the Blackbird No3 I have. This is a large pen – nearly 13.5cm long and unusually has a Blackbird nib with heart-shaped breather. Well spotted! I don’t think this section is original. I tried to find a replacement one but I had nothing that would fit. The cap didn’t fit properly when I got the pen because the section was too long and I had to reduce the inner cap to cure that problem. Ha ha – well I can confirm that the section looks very similar to the one on my Blackbird 3 (on which you shortened the broken cap) and which has a stepped clip. I’ll sort out a photo. Having seen your photo I agree that the section is very similar to mine. Mine is also marked “Blackbird”. I also thought the section looked wrong so I checked against my examples of this pen. Mine are identical so I didn’t post. Perhaps I should have done.